I met a lovely lady at a networking event recently who, upon introduction, rather flatteringly said she’d seen my design work and wanted someone to be able to do stuff like that for her. Her current designer wasn’t ‘getting it’ (she’d even sent them pictures from this site!). I laughed, “Why didn’t you ask me?” and gave her my card. A month later she called. Could we meet up about this brochure? 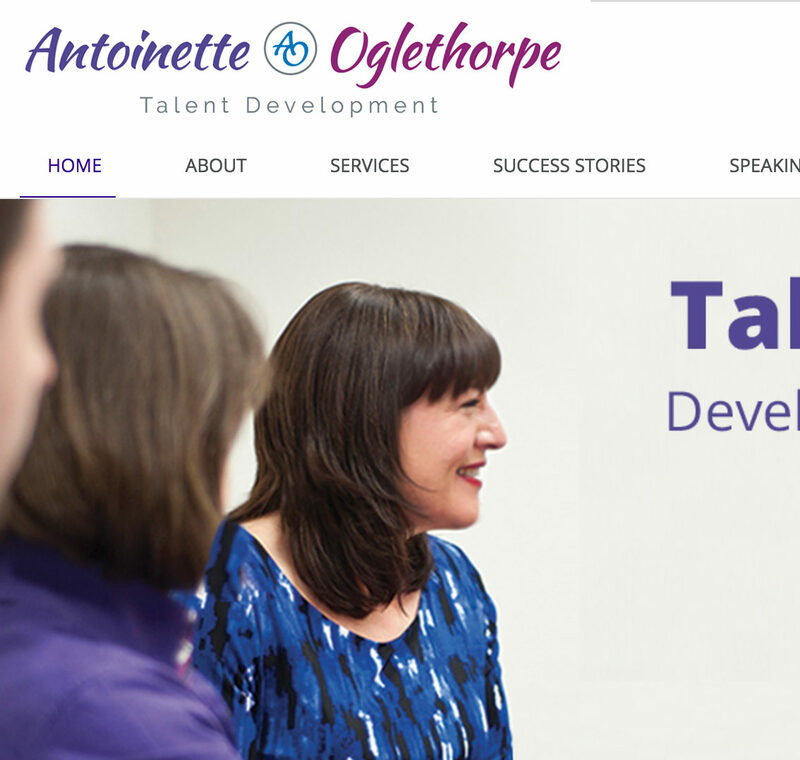 Antoinette Oglethorpe’s company helps high-tech companies realise the leadership potential of their people. The client is often (although not always) male and ‘techy’. In such companies, the CEOs or VPs may typically be younger, find success quickly, but are just inexperienced at developing their managers’ careers to sustain growth. What then followed – a bit of back-story before the brochure briefing – ended up as an epic saga of Antoinette’s painful experiences with previous designers. I listened intently, and made notes. When I’d first met her, Antoinette had just won a pitching competition speaking confidently, compellingly about her business. This woman clearly knew her sh*t, yet had so far struggled to find someone to communicate this visually for her. She’d been so “burned”, she questioned if she was a difficult client and did I even want to take her on?! I already knew I liked Antoinette, with her disarming honesty, and I knew I could help her. Then she laid out all her current collateral (business cards, website, cards, book jacket design) and asked me for my opinion. Turns out different designers had done the various bits, which explained the lack of consistency and strategy. I didn’t want to dispirit Antoinette so I gave her the positives too. Antoinette was just about to launch her book; the cover had tested well and she’d already been promoting it online. She knew that if she was going rebrand it needed to be ASAP. Looking at everything, I’ll admit I was perplexed as to how to bring it all together without starting from scratch. I slept on it, and the next day, started Antoinette’s Brand Assessment. The Brand Assessment is our free diagnostic service to assess the strengths and weaknesses in your branding, with recommendations to help achieve your business goals. It’s a vital part of our process: showing we understand the problem(s) and outlining our strategy. On the logo: Your current logo is very feminine. This may be a good representation of you as a person, but does not have sufficient gravitas for your target market. As typefaces go, I don’t love it. I would propose a different typeface with a stronger feel … and to look at other colours. I am not convinced by the ‘AO’ roundel…(Antoinette later explained that as her name is so long, she sometimes just uses the roundel, so she did need something). The strapline ‘Talent Development’ could apply to any industry, but your business is super-focused… Could it be stronger? Website: In look and feel, I think this element of your collateral speaks more to me about your identity and personality. It’s the thing I’d change the least. Services icons (below): …too many colours/fonts/weights of images. I suggest redesigning icons in the style of your book jacket to pull things together stylistically. Brochure: …dated design… a LOT of colours and clashing design elements! No synergy at all with your website…any new collateral needs to have a more refined colour palette and tie in more to the look/feel of your website. Book: Design is striking… but the green colour isn’t ‘on brand’ for you at present. Palette: …keep the bluey-purple of your current palette (or similar) as it’s very ‘you’. The pink shade is too feminine for your male audience. The grey is calming, measured and a good foil for the jewel colours. The cyan is jarring. Your brochure ‘palette’ is too much. A limited palette will make you look more ‘pulled together’ and professional. I then went on to give her my recommendations. I see this happen all the time. Clients come to us after they’ve tried – and failed – to get their branding done more cheaply or quickly or piecemeal, without any strategy. Then they work with us and realise, if only they’d come to us first, they could have saved so much time, hassle and money! Antoinette needed to rebrand before the book launch, but didn’t relish the prospect of redesigning that too. Next week: A logo update and a new palette. For your FREE Brand Assessment, contact us to book an initial 20-minute conversation. If you qualify, you’ll get a free, no-obligation written report of your branding and how you can improve it.